Did non-voters outnumber the supporters of each political party in the UK in 2010? The image does not cite a source for its information and after an (admittedly brief) Googling exercise I was not able to find a source which provided actual numbers (although some secondary sources gave percentages). 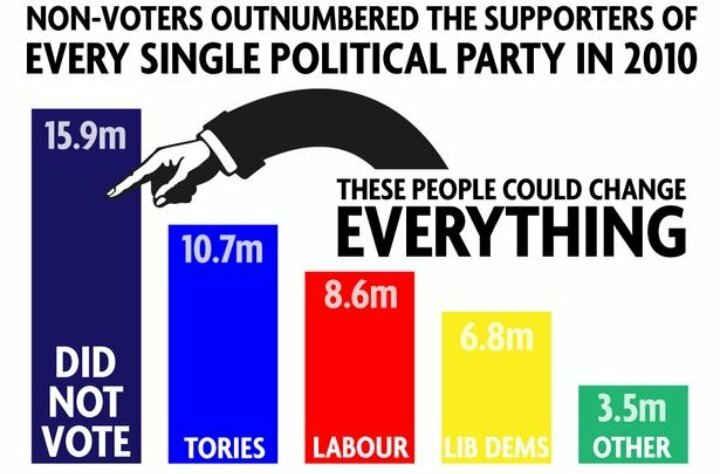 Is the assertion that "non-voters outnumbered the supporters of every single political party" true? BBC 2010 election page gives a summary. The data can be found at the Electoral Commission which oversees the votes. These numbers are on a turnout of 65.1%, which is the sum of all valid votes. Thus, 100 - 65.1 = 34.9% did not vote. Turnout was 29,691,380 - this is all valid votes. So those not voting (including spoilt ballots and invalid postal votes) = 29,691,380 * 349/651 = 15,917,499. This is the number registered to vote, thus matching the graphic. Not the answer you're looking for? Browse other questions tagged politics united-kingdom voting . Is there a significant difference between voters and non-voters preferences in political elections? Was the September 2012 jobs report manipulated for political purposes? Is voter fraud practically non-existent in the United States? Do non-educated people tend more to the right/conservative political wing? In the USA, do supporters of the Republican party make more charitable donations than supporters of the Democrats? Did a German party ask a Holocaust denier to assess the antisemitism of a party member? Are 2 million non-citizen Hispanics illegally registered to vote in the United States? Is the skeptical movement an offshoot of the Communist Party?